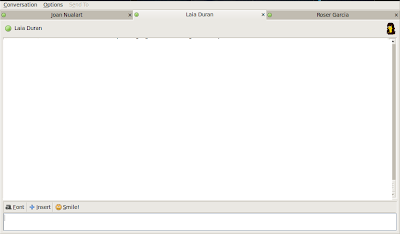 Two and a half weeks ago, I got a netbook and promptly installed Ubuntu, followed by Fluxbox (as already explained). And after two weeks of almost continued use, I like it even more than when I decided to use it. Some of the points I really enjoy (in no particular order). 1. Strong keyboard shortcuts. As an emacs junkie as I am, I love keyboard shortcuts. And Fluxbox is incredibly flexible in defining or removing them: Even system-wide shortcuts are customizable. And avoiding the use of the trackpad (if it were as good as a Macbook one, I wouldn't mind, but it's not the case) is a big point. Now I have keyboard shortcuts, usually Windows key (I found something useful to do with it!) and a letter (i.e. WK+e for emacs, WK+f for Firefox) or Control+Windows key+letter, if it has already been defined (WK+p is Pidgin, and C+WK+p is gnome-screenshot). 2. "Desktop" level applications. 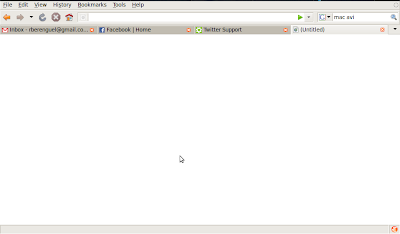 One of the first additions I got in Fluxbox was conky, a system monitor, which sits in your root window: your "desktop". I always put it around quotation marks, as I think a desktop without files sounds strange... But I don't mind anymore: I mapped Shift+F11 (in the same vein as I have F11 for show desktop in my Mac) to open Nautilus, this way I don't even recall missing it. But the point is that any application can be "rooted" by changing its default layer, and saving the configuration (right click, or whatever you have configured in the window's pane, select remember, switch on the desired features and then "save on close"): this way every time you issue the 'ShowDesktop' command (which I set up as Shift-F12) you also see the rooted application. In my case, I have an aterm with pseudotransparent background and without window decorations. 3. Window decoration easy removal. WK+t toggles WindowDecoration on and off. And you can set a window to remember its last state... so my Firefox, terminal applications and emacs no longer have window decoration. Saving screen real estate is a point, and more so in netbooks. But if I were to need it, just a keypress and it is there again. Together with auto-hide of the Toolbar, I get extra screen height available. 4. Tabs. I started to use tabs very recently. In short, you can group two (or any number, in fact) "windows" in one "big window", by drag-drop of the window pane of one into another while pressing WK (usually it is mapped to using the middle mouse button, but I don't have one, naturally). And switch from one to another indepently of the rest of the system. I use it among "related" tasks, for instance my Pidgin chat window and Firefox (or emacs and evince), this way WK+tab switches between just these two tasks, and if I want to go away (emacs, Nautilus... any other open window) I just alt-tab once and get to the next. Obviously there are also numerical shortcuts for any tab: WK+1 takes you to tab one, and so on. I know, the way I use it is more or less like Alt-Tabbing... but it doesn't exactly feel the same: I don't have to backtab. I will be using it more and more, probably as I love this feature.